This verse from Peter touches on a great deal of big theological topics – End Times Prophecy; Salvation; God’s Time. Peter’s second letter is a letter of warning – the biggest threat to the Church isn’t the oppression of external forces, but the decay of the internal members. 2 Peter is also uniquely noted for a chapter devoted to explaining the end times prophecy. At the time of writing, decades have passed since the time of Jesus, and it should be understood that right from the very start, the disciples were already waiting for the second Coming of Christ. I don’t think any of them could imagine that 2000 years later, Christ has not returned. 30 years is a long enough wait, but 2000 years? Peter predicts that “in the last days scoffers will come, scoffing and following their own evil desires. 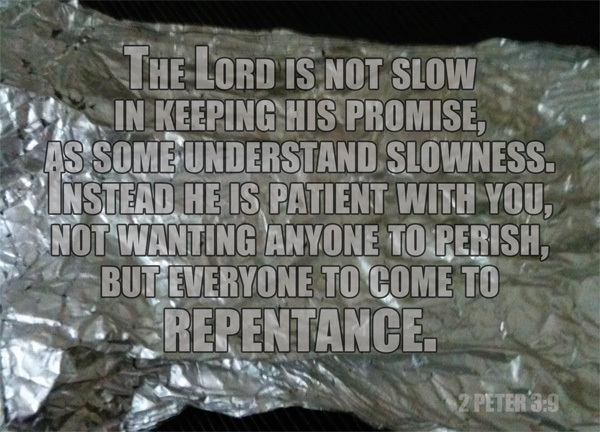 They will say, “Where is this ‘coming’ he promised?” [2 Peter 3:3-4]. 2000 years later we’re exactly in that position that Peter described. In this study, we will examine Peter’s explanation for this length of time and ponder a little on this major prophecy. The Lord is not slow in keeping his promise, as some understand slowness – We run on a completely different timescale as compared to God. Indeed, Peter also highlights this fact as he enters into the discourse that the Lord is not late – refer to the verse before this – But do not forget this one thing, dear friends: With the Lord a day is like a thousand years, and a thousand years are like a day. [2 Peter 3:8], which is most likely inspired by Psalm 90:4 [Article] – For a thousand years in your sight are like a day that has just gone by, or like a watch in the night. Instead he is patient with you, not wanting anyone to perish, but everyone to come to repentance – Let us not see God’s graciousness and mercy as a delay in the fulfillment of his will. God runs on the clock of eternity – it’s a timescale that we’re perhaps completely unable to comprehend. God can wait. It has been 2000 years, but according to that timescale of Moses, where a thousand years is merely a quarter of a day – then it hasn’t been that long; barely half a day to God. What’s more, Moses merely gave us that example just to scale it somewhat for us – but in reality, God runs on the timescale of eternity. It hasn’t been that long. God is capable of making men wait – he has proven it over the generations of the Israelites – it took them hundreds of years to get out of Egypt. It took them hundreds of years for the Messiah to come. It took Moses 40 years of obscured life in the desert before God finally used him. It took Jacob 20 years before he was led back to his father’s home. It took Abraham a decade of hard faith before he got the son he so desired. Indeed, by all human accounts, God seems slow this time. 2000 years is, by any yardstick of human history, a very long time. But God can afford to wait. It’s just like how he waited on Nineveh – in the time of Jonah, they repented, and God delayed his destruction plan on them – in the time of Nahum, God delivered Nineveh’s destruction. This is a world of injustice, but God will one day deliver his justice. God is, in our eyes, slow in his justice simply because he desires every last one of us, as a race of humanity, to be saved. If you only believed in Christ 2 years ago, try imagining if the world ended 3 years ago? God is gracious, and he desires salvation for all humanity. But ultimately, we know that not everyone will be saved; and the day of the Lord will eventually come like a thief [2 Peter 3:10]. Let us not see God’s graciousness and mercy as a delay in the fulfillment of his will. Let us not regard his patience with agitation. God has his own timing. Let’s learn to have his patience, his graciousness and his love. There are many prophecies in the Bible, and some of the most notable ones are of course, the destruction of Israel/Judah in the Old Testament; the prophecy of the coming of the Messiah; and of course, the end times prophecy. These are big, big prophecies, and the amount of time involved from when they were first prophesied to when they are finally fulfilled is no joke – we’re not talking about years, but hundreds and thousands of years. The most crucial thing with prophecies is that, you never know when they’re going to happen. We’re not allowed to know. When Jonah when to Nineveh to prophecy that they are going to be destroyed because of their sins, he must have been upset, because God ultimately forgave them. But was his prophecy false? No – A prophecy that comes from the Lord is never false. Nineveh did face its destruction, although not in Jonah’s time. God is gracious, but make no mistake – his mercy does not mean the extinction of his justice.